Alternate Titles: Kateikyoushi Hitman Reborn!, Home Tutor Hitman Reborn!,家庭教師ヒットマンREBORN! Tsuna is a hapless youth with low test scores and lower self esteem. His mother hires a tutor to help Tsuna out, but it comes as a surprise to the both of them when the tutor is a baby named Reborn, claiming to be from the Mafia. Reborn informs Tsuna that he's the next heir to the Vongola family mafia family and tries to help Tsuna reach the goal. Reborn possesses the Dying Will bullet, which kills a person and brings them back to life to fulfill the last regret they had, and even works to get Tsuna some henchmen to make him a true mafia boss-in-training. Watch Kateikyoushi Hitman Reborn! Episodes Online at Animegg.org. 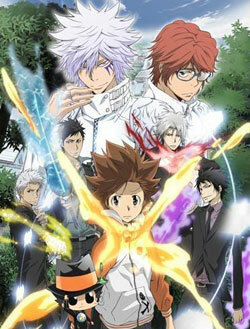 Kateikyoushi Hitman Reborn! is available in High Definition only through Animegg.org. Choose an episode below and start watching Kateikyoushi Hitman Reborn! in Subbed & Dubbed HD now.